Is there a possibility to make voice input with Siri shortcuts? I haven't found it. What I want to do is to create a new todo item on my todo app in my case trello, but I don't want to manually type the todo item in, but dictate it via voice. Say "trello new card: [INPUT]" and then it creates the card. Is this possible? Also to send a message it would be nice to be able to have voice input. Yay my first Shortcuts question! 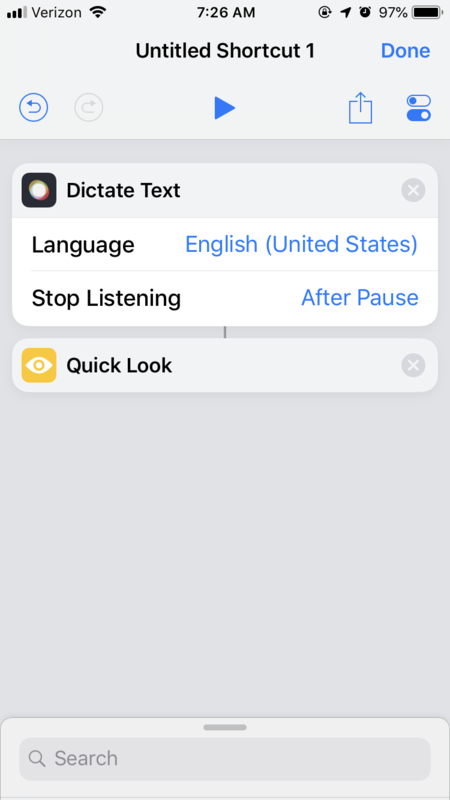 Use the Dictate Text action. This action will convert words you speak into to text and pass that text to the next action. Currently, there is a bit of down side: You will not be able tell Siri in one sentence "Tell [Shortcut Trigger], Apples are cool" Instead you need to do it in two parts "[Shortcut Trigger]" wait... "Apples are cool". Warning: Make sure to pick a language or it will silently fail. How do I get my iPhone to type the word “Period” instead of the punctuation while dictating? Why is iTunes duplicating my Voice Memos? What is this new voice control thing Siri? Take a photo using Siri voice activation? How does the iPhone 3.5 mm port work with regards to input?